The South Africa men’s hockey team beat Canada 2-0 at a packed Hartleyvale in Cape Town late Sunday afternoon after leading 1-0 at half-time. Jonty Robinson scored from the penalty spot in the 24th minute after Dan Sibbald had been upended in the strike zone, this after the midfielder had received the ball in space and made ground to set up a goal shot. Tevin Kok, one of the numerous new players in the SA squad who have been put through their paces during the past 10 days, scored SA’s second goal in the 39th minute with an excellent backhand shot. The fixture was changed from Test match status to an international match at the request of the Canadians but as SA head coach Fabian Gregory said afterwards, “Hey, we’ll take the win, it was well-deserved”. The vibe in the stadium was a treat, according to a spectator, and for the most part the SA men didn’t disappoint. In spite of that, the SA men were left to rue a great opportunity when they squandered a three-versus-one situation. Gregory said SA started poorly in the second half but once the team began to press higher up in the field and the midfielders wrested control, their fortunes changed. “We had clear-cut goalscoring opportunities and I was disappointed that we failed to convert them,” said the coach. One of the big pluses during the team’s time together in Cape Town has been the massive improvement in their defensive structure, said Gregory. The coach was also pleased to give young keepers Rob McKinley and Chad Durrheim a run in the second half after Gowan Jones took care of the goalmouth in the first period. “What I have been really impressed with over the past 10 days is how the senior players have answered my call to raise their level and the way in which the new guys have stepped up to the requirements of senior international hockey,” was Gregory’s parting shot. The final test of an intense 8 match warm weather series produced nothing short of 9 goals and plenty of action for the spectators supporting the sides in the Cape Town heat. Gougnard, on the score-sheet in yesterday’s game as well, got the Belgian Red Lions off to the ideal start. A well-worked training ground routine saw Gougnard retrieve an aerial ball from the Cape Town sky and round Jaime Carr in the Green Machine goal to make it 1-0. Tom Boon, with over 200 caps to his name, doubled the Belgian lead with one of his trademark drag flicks, 2-0. But before the half time whistle sounded, Sothern with a drag flick of his own, fired Ireland back into the game to make it 2-1. The start of the second half saw the men in green earn a quick PC, O’Donoghue’s shot flew just past the post but an equaliser was coming. The ever-reliable Mitch Darling broke into the circle on a counter attack and, showing steely composure, he levelled the match with a stunning reverse strike, 2-2. Two quick goals in the final quarter by Dockier and van Aubel appeared to put some light between the two teams. However, no sooner had the 4-2 score-line appeared, it was changed again thanks to a superb drag flick from Shane O’Donoghue to make it 4-3, then moments later Dockier got his second with a deflection into the top corner, 5-3. The final moments of the game saw Boon double his tally as he deflected in at the back post, 6-3. Reflecting on the squads’ warm weather tour, Coach Craig Fulton said “ We have had a tough Olympic training camp in Cape Town. 8 games in 11 days, as well as training, have been invaluable for the whole squad. The hot and windy conditions made it realistic conditions for the Olympic Games in Rio. It has been a good camp, and a good foundation to start 2016 for us”. The Netherlands retained the women’s EuroHockey Indoor Championship title in Minsk, beating Poland 6-2 in today’s final. Donja Zwinkels gave the Dutch a fourth minute lead before Lieke van Wijk – with her eighth goal of the competition – made it 2-0. Poland kept in touch with a goal from Joanna Mika before half-time while the game was still in the balance at 3-2 to the Dutch with 12 minutes to go. But the Netherlands stretched out their lead in the closing quarter of the game with Lisanne de Lange, Marijn Veen and Frederique Matla to retain the crown, their second in the history of the competition. Belarus gave the home crowd plenty to cheer about with a 6-5 victory over Germany in the bronze medal match, Krestina Papkova snatching the winner in the closing minute. Ukraine and the Czech Republic finished fifth and sixth place, respectively, with Austria and Belgium ending up in the relegation places. They will be replaced in the top tier in 2018 by Russia and Switzerland . The Russians completed the second tier tournament in Cambrai with a perfect record of five wins from five across the weekend. The Swiss just about edged out France by a single point. A fantastic 5-3 win over England ultimately led to Scotland Senior Women escaping relegation and retaining a place in the EuroHockey Indoor Nations Championship II. The victory over England meant that Croatia would need to win by five goals against Wales to overhaul the Scots, but they fell short in a 5-3 win. The national side raced into a two goal lead, Charlotte Watson scoring a double inside five minutes, including a field goal and a brilliantly worked penalty corner set-play. However, England were back on level terms before the mid-point of the first half courtesy of a Hannah Martin field goal and Grace Balsdon penalty corner. English attacker Sarah Haycroft put her side in front in the 15th minute, only for Katie Robertson to pull Scotland level two minutes before half-time. A closer second half ensued, but the Scots managed to put themselves in the lead again in the 28th minute when Jen Eadie converted from a penalty corner opportunity. A Scottish win was sealed right on the stroke of the full-time hooter when Vikki Bunce broke away down court to slot the ball into the net to ensure survival for her side. England’s EuroHockey Indoor Championships II came to a disappointing end on Sunday morning with a defeat in their final game to old foes Scotland. With the bottom two in Pool D due to be relegated form this level, there was plenty to play for with England almost safe and Scotland looking over their shoulders at Croatia and Wales below them. Ultimately both sides secured their status in this division thanks to a 5-3 win for Scotland but it was a disappointing end to a competition in which England had improved with every game. The Tartan Hearts came out of the blocks quickly and Charlotte Watson helped herself to two early goals in the first five minutes to leave Andy Halliday’s side reeling at 2-0 down. Hannah Martin hauled one back in the sixth minute, showing once again her promise at this level. In the ninth minute Grace Balsdon fired home a trademark penalty corner, taking her tally to six goals and third place in the tournament top scorer charts. England nudged themselves in front before the break with an open play goal from Sarah Haycroft but despite some good passages of play Katie Robinson’s goal ensured the game was well poised going into the second half with the scores level at 3-3. Scotland, now fighting for their survival threw everything at England in the second period. Chances came and went at both ends before in the 28th minute Jennifer Eadie kept her cool to put Scotland ahead from a penalty corner. With England pushing for an equaliser they opted to play with no goalkeeper, hoping the extra outfielder would pay off. As is often the case, the gamble backfired and with no goalkeeper to beat Vikki Bunce secured the points for Scotland with a 40th minute goal to make it 5-3 and preserve her side’s place in the second tier of European indoor hockey, alongside England. 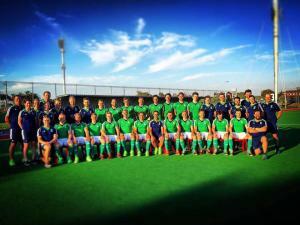 ‘Very disappointed with the ultimate result in a tight game vs. Scotland. We showed naivety in areas where progress had been made yesterday. Decision making under pressure and executing core skills were poor this morning. I felt we controlled much of the game, pressed well, but were unable to convert chances. As with the men last week, I am sure the pressure of the weekend will be beneficial for outdoor development. Indoor provides an exposing environment where poor chances and technique are magnified by the outcome. I have been very pleased with the attitude and growth mindset of the group. It was just a real shame that we couldn’t maintain the momentum of yesterday into our performance this morning’. ENGLAND women kept their place in the second tier of the EuroHockey Indoor Championship in Cambrai, France, but it was a disappointing three days as they won only two of their five games. After defeats by Russia (2-6) and France (2-3) on day one they had to win two of their three remaining games to avoid relegation and they did that on Saturday with 9-1 and 3-2 victories over Wales and Croatia respectively before a 3-5 loss to Scotland on Sunday. Against Wales, who had also lost both previous games, they were three up from two corner strikes by Canterbury’s Grace Balsdon and a field goal from their captain Reading’s Susie Gilbert. Julie Whiting pulled one back before half-time but England then piled on the goals, all from open play. Holcombe’s Lucy Wood struck twice before University of Birmingham’s Hannah Martin bagged an eight-minute hat-trick and Surbiton’s Sarah Haycroft added a ninth just before the end. It was a much closer match with Croatia, who scored in the first minute from an Anamaria Somin corner, leading at half-time after Ansley’s 17th minute corner was trumped by Marina Abramovic’s set piece just before the interval. But field goals from Balsdon and Wood saw England home. England went into their final game with Scotland virtually assured of avoiding relegation, while for their opponents it was a must-win game. The Scots took a two-goal lead in six minutes through Charlotte Watson but England had levelled within four minutes through Martin and Balsdon – her sixth of the tournament – and took the lead on 15 minutes with a Haycroft field goal. But that was their last in the game as Katie Robertson, before the break, Jennifer Eadie and Vikki Bunce, in the last minute, gave the Scots a 5-3 victory. England finished in fifth and Scotland in sixth place, both staying in tier two, but Wales lost all their games and are relegated ……..but to where? This season there were insufficient teams to hold a third tier tournament. England head coach Andy Halliday said: “I’m very disappointed with the ultimate result in a tight game with Scotland. We showed naivety in areas where progress had been made yesterday. Decision making under pressure and executing core skills were poor today. I felt we controlled much of the game, pressed well, but were unable to convert chances. “As with the men last week, I am sure the pressure of the weekend will be beneficial with outdoor development. Indoor provides an exposing environment where poor choices and techniques are magnified by the outcome. However, the fundamental problem with English indoor hockey is because it is the poor relation of the outdoor game. As Halliday himself admitted after the first day’s two defeats: “Today’s results have really highlighted the minimal preparation we have had in the lead up to the tournament.” This was limited to a two-day domestic camp immediately before travelling to France. The Dutch, whose women became European champions in Belarus this weekend, have shown what can be achieved from a similar situation to England’s with real support for the indoor game. Australia’s U21 men and women have officially qualified for the Junior World Cup after both teams secured gold over friendly rivals New Zealand at the qualifiers on the Gold Coast over the weekend. Showcasing consistent performances throughout the qualifiers, the Jillaroos and Burras successfully won all three of their competitive meetings against the junior Black Sticks. It was a breath of fresh air for Australia’s men and women when they officially qualified for the 2016 Junior World Cup on Saturday, after defeating New Zealand in their second match of the tournament. Max Hendry and Madison Ratcliffe played important roles in helping Australia to their victories, finishing as the tournament’s top goal scorers. Australia’s U21 men and women will now move into preparation for the U21 Australian Championships in Sydney from 10 to 17 April. Off the back of the Sydney Australian Championships will be selection for Hockey Australia’s 2016 National Junior Squad. The Hockey Australia Futures Camp and Junior World Cup Qualifier are supported by funding from the Economic Development Branch of Council of the City of Gold Coast. Goal scorers: Georgia Wilson (3 FG); Madison Ratcliffe (37 PC). Goal scorers: Savannah Fitzpatrick (14 PC); Madison Ratcliffe (32 PC, 66 FG). Goal scorers: Madeleine Murphy (12 FG); Shanea Tonkin (27 FG); Mikaela Patterson (49 FG); Madison Ratcliffe (67 FG). Goal scorers: Frazer Gerrard (PC, 10); Tom Craig (13, FG); Andrew Scanlon (32, PC). Goal scorers: Max Hendry (23 FG, 25 FG, 44 FG); Isaac Farmilo (34 FG); Tim Brand (49 FG). THE Hockey Association of Zimbabwe yesterday named a strong national Under-21 Ladies hockey side to represent the country in the upcoming Junior Africa Cup to be held in Namibia. The Junior Africa Cup, which also serves as the continental qualifier for the 2016 Junior Hockey World Cup, will be held in Windhoek from March 18 to 28. Of the 18 players named, seven are based in South Africa and one in England. South Africa-based former Chisipite Senior School student Stephanie Campbell, who will captain the side, will be hoping to emulate the class of 2005, which qualified for the Junior Hockey World Cup held in Santiago, Chile. This year’s women’s Junior World Cup, which will be held from November 23 to December 4, makes a return to Santiago again, while the men’s Junior World Cup will be held in Delhi, India, from November 1-11. According to the Africa Hockey Federation website, nine men’s and eight women’s teams will grace the quadrennial event to be staged at the Windhoek Hockey Stadium. Defending champions South Africa, Ghana, Kenya, Nigeria, Zimbabwe, Botswana, Tanzania, Egypt and Namibia will feature in the men’s competition while only Egypt will not be represented in the women’s competition. The top two teams in both categories will represent the continent in India and Chile respectively. Chandigarh: Jaypee Punjab Warriors registered their second win on their home turf today defeating Dabang Mumbai 3-1 in the seventh match of the 4th edition of Coal India Hockey India League. The match which was being played at the sector 42 Hockey Stadium Chandigarh, saw the home team bounce back with the win and moved to the top of the league table with 11 points in their kitty. The first quarter of the match began with Jaypee Punjab Warriors attacking Dabang Mumbai, whose defence was caught off guard. The home team scored their first goal through young Indian forward Armaan Qureshi in the 9th minute giving him his first goal of the tournament and his team a 2-0 lead. The second quarter saw a tightened defence from Dabang Mumbai but in the 21st minute a penalty corner conversion by Christopher Ciriello put the match strongly in favour of the Punjab team with the score line at 3-0. The score stayed at 3-0 till the end of the first half. The second half saw Dabang Mumbai enter the field reenergised, as they started pressing hard on Jaypee Punjab Warriors. The change in the tactics paid off for the visitors with a penalty corner in the 39th minute which was excellently converted by the rising Indian drag flicker Harmanpreet Singh reducing the gap by a goal. The third quarter ended with the score at 3-1 still in favour of Jaypee Punjab Warriors. The fourth quarter saw many chances being created by both the sides but both the goalkeepers stood strong foiling all attempts from either sides. The home team’s defence held their nerve till the end of the last quarter and the match ended with the score of 3-1 giving the Jaypee Punjab Warriors their second win in front of their home crowd. Hero Emerging Player of the Match INR 25,000 - Varun Kumar. The next match of the 4th Coal India Hockey India League will be played between the Uttar Pradesh Wizards and Kalinga Lancers at the Major Dhyanchand Stadium, Lucknow on 25th January, 2016. CHANDIGARH: Punjab Warriors came out all guns blazing to beat Dabang Mumbai 3-1 in their third match of the Hockey India League at the Sector 42 Hockey Stadium here on Sunday. The win also took the Warriors to the top of the points table with 11 points from 3 games. Both teams began on an attacking note. In the 9th minute, Warriors' Mark Knowles sent a diagonal ball from the left to Matt Gohdes, who then supplied to halfback Armaan Qureshi and he made no mistake in beating Mumbai custodian David Harte for a field strike. A field goal is counted as two in this edition of the tournament and Punjab found themselves leading by 2-0 going into the second quarter. Warriors' drag-flicker Christopher Ciriello stepped up and scored with a powerful hit past goalkeeper Harte in the 21st minute. Mumbai's penalty corner specialist Harmanpreet Singh scored from one of the two with a rasping drive, in the 38th minute. Punjab will now travel to Ranchi on Saturday, while Mumbai next faces Delhi Waveriders on Friday. Chandigarh: Punjab Warriors returned to winning ways as they defeated Dabang Mumbai 3-1 and jumped to the top of the table in the Hockey India League here today. The Warriors, who now play two away games in a row, have 11 points from three matches. Armaan Qureshi and Christopher Ciriello scored for the hosts, while Harmanpreet Singh pulled one back for Mumbai. The Warriors, looking to end their three-game stretch at home with a win, improved their performance from their 5-4 loss to Delhi Waveriders and were far more fluent in attack. The hosts took the lead in the ninth minute when Qureshi was set up by a clever first-touch pass from Australian Matthew Gohdes. Qureshi's on-the-run strike beat Mumbai goalkeeper as Punjab took a 2-0 lead. The home side went 3-0 up after Ciriello sent home an accurate drag-flick from the first penalty corner of the match. Nine minutes into the third quarter, Harmanpreet reduced the margin with a penalty corner conversion. CHANDIGARH: Punjab Warriors inflicted second consecutive loss on Dabang Mumbai with a 3-1 victory to go top of the Hockey India League (HIL) at the Chandigarh Hockey Stadium here on Sunday evening. Punjab scored all their goals before half-time. The first came through Armaan Qureshi's field strike securing the winners two goals while the other was a penalty corner conversion by Christopher Ciriello. For Mumbai, Harmanpreet Singh got the reducer through a penalty corner after the breather. Australian great Jay Stacy-coached Mumbai, who lost their opening match to Kalinga Lancers on Thursday, remained the low-ranked team in the league table with two points from two matches. Punjab took their points tally to top the chart with 11 points from three matches -- one point ahead of second placed Delhi Waveriders. On a foggy evening, Mumbai threatened early with young German attacker building up the attacks but his efforts didn't bring the results -- on one occasion, Roshan Minz failed to deflect the ball home and in another opportunity, the defenders were up for the clearance. In the ninth minute, Australian Mark Knowles affected a cross-field diagonal ball from the left to compatriot Matt Gohdes, who supplied it to Qureshi and the latter beat Mumbai custodian David Harte for the field goal, which is counted as two in this edition of the tournament. Mumbai fell short of ideas to respond to the goal and ended up conceding another in the 21st minute. This time, Qureshi found the foot of a defender and earned a penalty corner. Australian Christopher Ciriello's powerful flick stunned Harte, who failed to react in time. Midfielder Sardar Singh and Simon Orchard created more chances for Punjab but they were not able to add any more goal till the half-time. Mumbai came out with much more energy after the change of ends and in the middle of the third quarter, earned two penalty corners. Harmanpreet converted the first one with a scorching grounder that went through goalkeeper Tristian Clemons. The Australian custodian made a diving save to his right to deny Harmanpreet in the second corner. Later, Barry Dancer-coached Punjab could have regained the three-goal advantage but Jasjit Singh Kular's flick was not enough in the fourth and final quarter. A desperate Mumbai missed the chance to reduce the margin with a messy penalty corner variation. It was their final realistic shot at the goal of the match. Gurwinder Singh Chandi and S.V. Sunil got two good opportunities but failed to score for Punjab as the match ended 3-1 in favour of the hosts. Punjab goalkeeper Clemons of Australia was declared the Man-of-the-Match. It was a good performance. Two wins out of three matches means that we are on right track at the moment," Clemons said at the post-match presentation ceremony. Pegasus continued their stunning run in the women’s EY Hockey League to move into the top three for the first time, their 2-1 success against Ards making it six wins from seven outings. The reigning national champions struggled early on in the campaign, waiting four games before eventually landing their first win. Since then, they have found their mojo in a big way and they got off to a flyer against Ards with Suzanne Beaney scoring a brilliant diving effort from Hannah Grieve’s pass. Chloe Brown levelled but Alex Speers got the final quarter winner to see Pegasus jump up another place in the division. They occupy the third of the three automatic places in the end of season playoffs, keeping alive their chances of retaining the national crown. One of those playoff places is all but guaranteed to go to Hermes barring a late blow-out to their campaign. They made it 10 wins from 10 with a 4-0 win over UCD. Chloe Watkins scored twice in the first 12 minutes from corners to build a commanding lead and fellow internationals Anna O’Flanagan and Naomi Carroll completed the result. Railway Union strengthened their hold of second place with an impressive 3-0 win at Cork Harlequins in monsoon-like conditions. Michelle Carey was a chief creator for the Dubliners, setting up Kate Dillon for the first goal and Zara Delany for the third effort in the final quarter. Julia O’Halloran, against her former club, nabbed the second goal. Pembroke got their first win in four attempts to move back into the top half of the table as they got the better of Ulster Elks 3-1 at Serpentine Avenue. Hannah Irwin had given the Elks an early lead but a Sarah Clarke corner along with final quarter efforts from Caroline Hill and Orla Macken completed the turnaround. UCC moved out of the relegation playoff place with a 2-1 win over Greenfields, built on two first quarter goals from Nicola Kerr. Maeve Hughes got one back – Greenfields’ second goal of the season – but UCC held on for their third win of the season to leap-frog Ards. The coming week sees a number of back matches on the agenda following pre-Christmas weather issues. Ards meet Ulster Elks on Wednesday evening while Pembroke host Greenfields on Saturday. Hermes can move 12 points clear if they win their refix on Sunday against UCC. Chloe Watkins’ pair of goals in the first 12 minutes saw Hermes ease to a tenth successive win in the women’s EY Hockey League, maintaining their massive nine point gap over the chasing pack. In a high tempo start, Watkins gave her side the lead from the first corner of the game with a lovely drag-flick. She doubled up soon after with a straight strike, carrying her good form from the Irish international team in midweek against Spain to the domestic stage. UCD endeavoured to bounce back and forced a number of good saves from Emma Gray from penalty corners and Hermes countered to brilliant effect. Sarah Patton was causing havoc with her pace throughout down the right flank and she set up Anna O’Flanagan for the third goal in the 26th minute, the power of the shot too much for Clodagh Cassin. Hermes defence, marshalled by Sarah Greene and Christine Quinlan, were giving nothing away. From this base, Greene picked out Nikki Evans with a lovely ball to Nikki Evans who drove forward and played a lovely give and go with Sinead Loughran. The final pass to Naomi Carroll gave her the easiest of chances to tap in at the back post. They held that 4-0 lead until the end. Hermes can extend their lead in the division to 12 points next Sunday should they win their refixed match with UCC. Railway Union strengthened their place in second of the women’s EY Hockey League with a strong away win at Cork Harlequins – a side who could have overtaken them had the result been reversed – at Farmer’s Cross. The Sandymount side came out of the traps the faster, camping in the Harlequins’ half. Kate Dillon had the best of the early chances but was denied one-on-one by the home goalkeeper Emma Buckley. Harlequins, who were without captain Cliodhna Sargent, came more in to the game as the quarter went on. Rachel Hobbs found herself in on goal but Grace O’Flanagan saved well from a tight angle. The Cork side had the only corner of the first 15 minutes where an Olivia Roycroft drag flick well saved again by the Railway keeper. In the second corner, A defensive lapse from Harlequins and some quick attacking play from Michelle Carey in the 20th minute led to a huge three versus one overload situation. Dillon made no mistake as she tapped in at the back post. Within a minute of the goal, Railway forced their first penalty corner which was well saved by Buckley, keeping the gap at 1-0 into the big break. Early in the second half, Emma Smyth received a yellow card but the shortened numbers didn’t impede Railway as they scored from their next attack. Julia O’Halloran – against her former club – found herself unmarked at the back post and finished off from close range for 2-0. Zara Delany and Dillon played the key roles in its creation. The Dubliners continued to hold more of the ball and the majority of territorial advantage but were foiled in their search for further goals by the efforts of Yvonne O’Byrne for Harlequins. The weather continued to worsen into the fourth quarter with the rain ramping up. Harlequins upped the tempo and forced two penalty corners within the first five minutes of the period but were unable to capitalise. O’Byrne started to get on the ball more for the home side but it was Railway who made the game safe in the 52nd minute. Zara Delany, who impressed all afternoon, slammed home from close to the penalty spot after the ball broke her way from Michelle Carey’s assist. The result sees Railway sit in second place, two points clear of Pegasus with Cork Harlequins dropping to sixth but still in contact with the playoff places. Pembroke claimed their first win in four attempts to reignite their push for the playoff places, coming from a goal down at half-time to defeat the Ulster Elks and rise to fifth place in the division. After a scoreless first quarter, the Elks stepped up the pressure after the re-start and took the Pembroke defense by surprise when, in the 22nd minute, Hannah Irwin’s shot found the back of the net. After the break, though, Pembroke made all the decisive moves. They were awarded a penalty corner in the 39th minute which was slammed home by Sarah Clarke. Elks were reduced to 10 players for a short period which allowed Pembroke to build further the momentum. And they duly won the tie in the closing quarter. The second goal was created by good work up the left wing by Jill Collins who switched the ball to the right to Caroline Hill who made no mistake in finding the net. The Elks responded well through Shirley McCay whose shot was saved by Jessie Elliott in the Pembroke goal. It set the base for a pitch-length counter which was picked up by Orla Macken at the edge of the circle and she made no mistake for 3-1.
Pegasus made it six wins in seven games to move into the top three in the division for the first time this season, getting one over on their Ulster rivals Ards who drop into ninth place. They got off to a flying start with Hannah Grieve picking out Suzanne Ferris in mid-circle and the ace striker brilliantly flipped the ball onto her backhand and, on the dive, fired passed the Ards’ keeper. The pace of the match was high despite much of the game being played between the 23m lines while both teams held firm against penalty corner chances, keeping the narrow 1-0 lead in place for a long time. It remained that way until the 48th minute when Pegasus didn’t clear their lines and the ball was worked to Chloe Brown who shot home from 10 yards out. Pegasus were intent on not letting Ards back in and upped the pace and were rewarded with what turned out to be the winner when a great run from Hannah McMillan saw her find Alex Speers in the circle who finished off low into the net. Two minutes later, Sammy Jo Greer pulled off the save of the match to keep Pegasus ahead; a diving stick save to her right from a drag flick. It kept their 2-1 lead in tact and continues their move up the charts. First quarter goals from Nicola Kerr saw UCC claim their third win of the EYHL season, moving them out of the relegation playoff place for the first time since October as they jumped ahead of Ards. Captain Kerr had them 2-0 up with precious little time but they did not pull away from the Galway side who fought back and got their second goal of the season via Maeve Hughes. Indeed, it was their closest run result of the campaign as they look to show a more competitive edge in the second half of the campaign. THE Junior Hockey League (JHL) season is almost at its midway point, but teams or individual players have yet to show any promise in both the divisions. Initially a record 36 teams registered for the tournament which was incepted in 1995, but Larut Matang and Selama withdrew three days from the start. The remaining 35, 10 in Division One and 25 in Division Two, have dished out a paltry dish and there seem to be no above average talent who shone above the rest. In Division One, four-time consecutive double champions SSTMi Thunderbolts started off promisingly by beating SSTMI Juniors 8-1 and Olak Tigers 7-2, but struggled against last seaon's Division Two teams Nur Insafi and SMKDBL Young Guns. Boht the teams played in the Division Two final last season, where Nur Insafi edged SMKDBL Young Guns 3-2 -- and both the promoted to Division One this season. And surprisingly, SSTMI could only beat SMKDBL Young Guns 3-0 and let in the first goals against Nur Insafi before beating them 4-1. SSTMI meet Petaling Jaya City Council (PJCC) on Friday, and if they continue playing like this, they might drop three points. The only spark in this JHL is SSP-MSP-Thunderbolts who are second on the Division One standings but have played on ematch less that leaders SSTMI Thunderbolts. The Pahang Thunderbolts, SSP-MSP, are fielding four 16-year-olds, seven 17-year-olds, five 18-year-olds and only four 19-year-olds in the ongoing JHL. Some of their players, although yet to mature, have shown glitters of promise and could surprise the gallery when the dust settles. In Division Two the 25 teams, with 20 players each, are just going through the motions of completing their fixtures -- and that's 500 players who have poor basics. The stands have been empty not only of spectators, but also Malaysian Hockey Confederation (MHC) officials and scouts. That's the state of the JHL at the half-way mark of the League stage. Hockey New Zealand will provide more support to community hockey throughout the country following the introduction of two new roles. Colin French has been appointed as Community Hockey Manager – Adults and Club Development, while Jack Clayton joins the team as Community Hockey Manager – Young People. The key responsibilities of the Community Hockey Manager – Adults and Club Development include leading participation programmes for adults throughout the country and driving the Community Hockey Club Development programme. The Community Hockey Manager – Young People role will lead the delivery of the Community Hockey team through the Regional Development network and associations, oversee delivery of the Small Sticks programme, and implement participation programmes for youth. Both French and Clayton are long-serving members of the hockey community and are important additions towards growing and enhancing the sport. French has been involved in grassroots hockey most of his life as a player, umpire, technical official, and administrator. He is currently chair of the Hockey New Zealand Umpires and Officials Council (from 2011 to current date), FIH Umpires Manager (since 2014) and has a strong connection with North Harbour Hockey on the Umpires Committee (from 1992 to current date) and Association Council of Clubs (from 2013 to current date). Clayton has been Regional Development Manager for Waikato Hockey and Sportsforce Officer for Sport Waikato over the past eight years. He has been involved in hockey since 1973 as a player, coach, manager, selector, committee member and club president and has played the last four years for the New Zealand 50+ Masters team at two World Cups and two trans-Tasman tournaments.